When it comes to feasting around Woolloomooloo ‘in-the-know’ locals venture beyond the fine dining restaurants along Woolloomooloo wharf. The wharf restaurants, with their sparkling harbour views, bring that ‘loving life in Sydney’ feeling, but it’s usually followed by a pretty hefty bill. 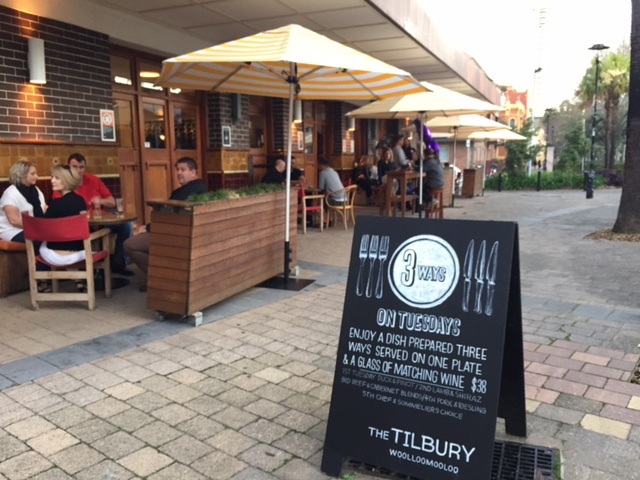 Those looking for a taste of the real Woolloomooloo with good hearty food, alfresco drinking and a lively local atmosphere head to The Tilbury Hotel. The Tilbury Hotel is one of Sydney’s classic pubs, with a history dating back almost 100 years. It’s location in the heart of Woolloomooloo makes it easily accessible by foot – and you can’t beat arriving via a leisurely walk from Circular Quay or Potts Point. I’ve spent many sunny afternoons in the dual level alfresco courtyard and deck. So I thought it was about time I experienced The Tilbury’s more refined side with a dinner at the pub’s light and airy restaurant. 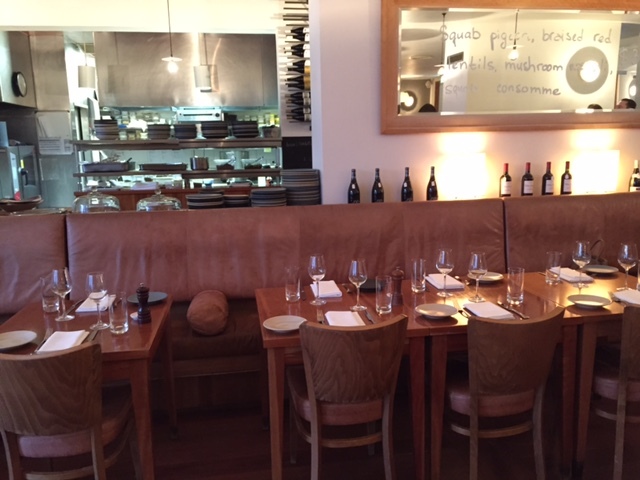 The restaurant interior is timeless and elegantly ageing. It’s modern and comfortable and isn’t trying to be a trendsetter. The restaurant is awash with varnished wood and extra comfy leather banquet seating that offers the perfect spot to while away a few hours. James Wallis, the restaurant’s head chef, hails from the UK where he served up gastro pub food. Being relatively new to Australia James spoke of being overwhelmed with the quality and diversity of Australian produce. 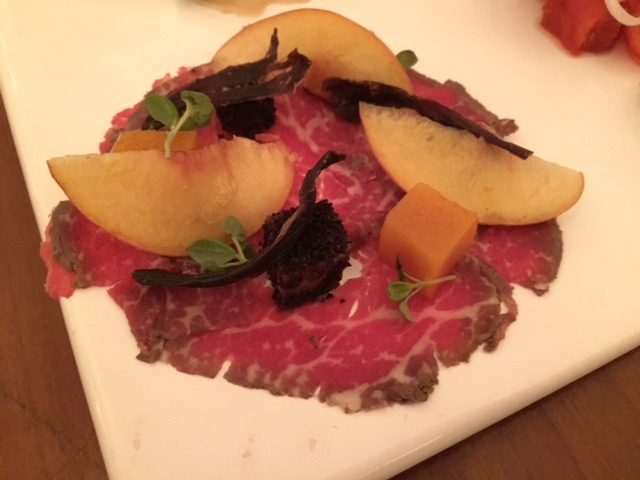 Here in Sydney James has created a contemporary seasonal menu that showcases both his overseas experience and the also the quality produce that he’s managed to get his hands on. 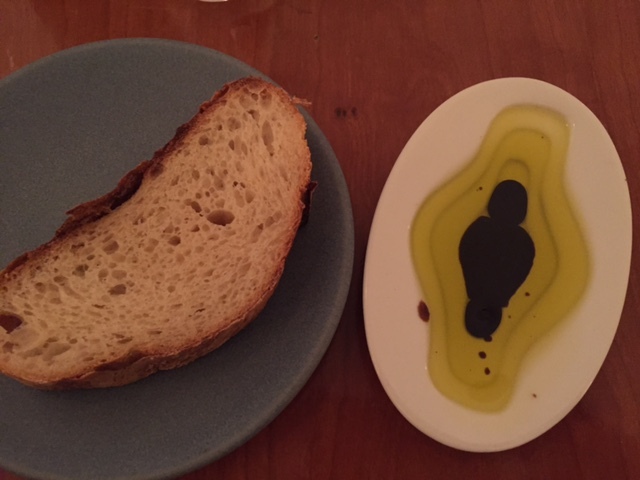 It’s always a good start to a meal when you receive sourdough bread on the house. 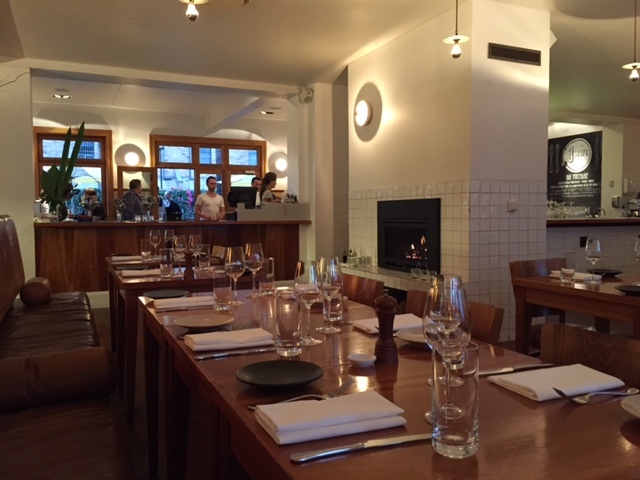 At The Tilbury Hotel they favour one of Sydney’s best – naturally leavened hearth-baked sourdough bread from Iggy’s. 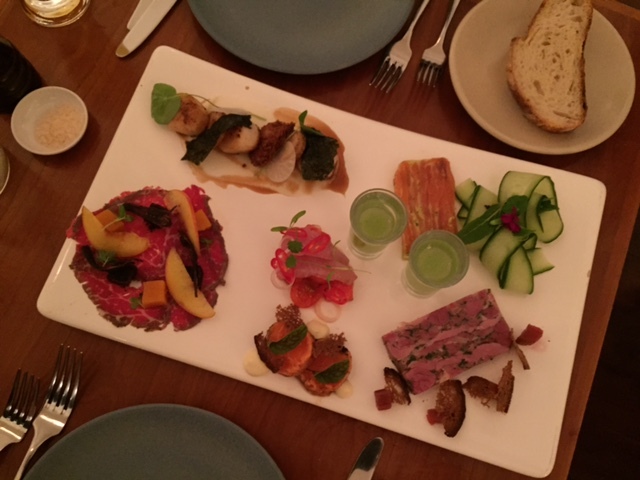 Choosing an entrée was deliberation free with James presenting a mixed platter of the smaller dishes. 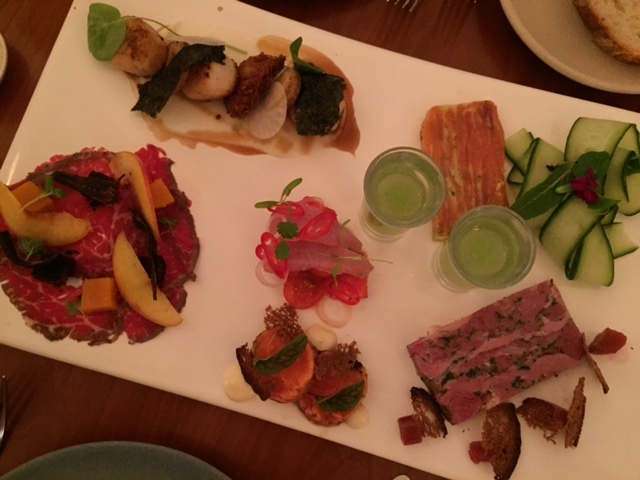 I was lucky enough to have a taster of everything from the terrine to the carpaccio, from the salmon to the scallops. Each entrée contains a little of the unexpected – keeping the presentation and flavour extra interesting. I’m talking a beef oxo cube served with the carpaccio, crispy pigs tail paired with scallops and rhubarb matched alongside terrine. James spoke of his love for the nose to tail philosophy. Crispy pigs tail? Of course it accompanies the scallops. Bone marrow fritter? Yes with every steak. So nose to tail had to be the way to go for main course. 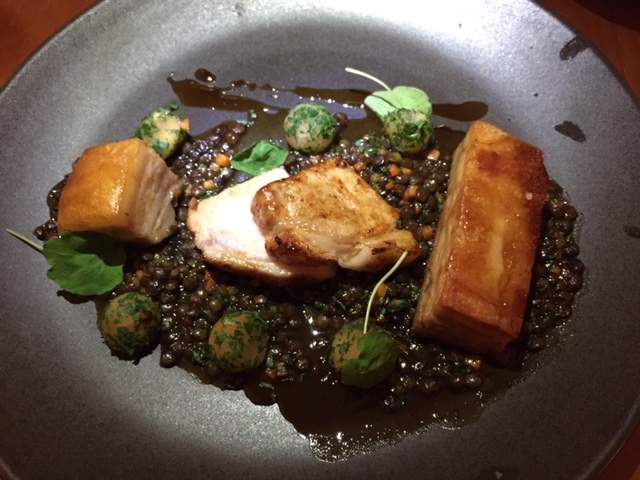 It was the pork medley that grabbed my attention – a trio of pork cuts – the belly, the loin (meat from the top of the rib cage) and jowl (pork cheek). The main courses, like the entrees, are generosly served and hearty. Like the Tilbury Hotel itself they’re not trying to be trendsetting dishes but rather ‘a fresh approach on modern classics’. The price point is as refreshing as the beer too – from $26 to $35. 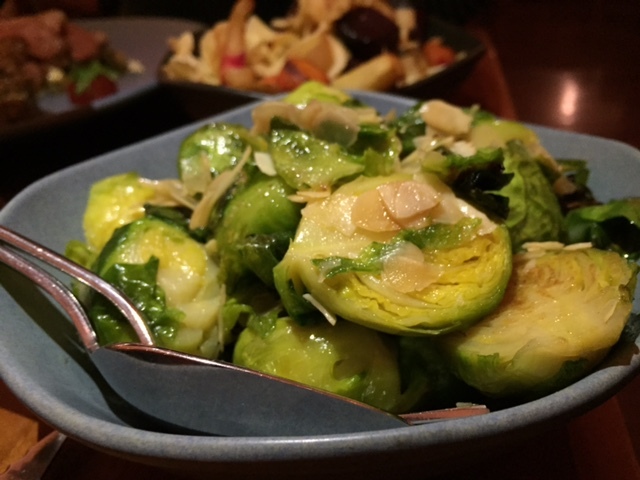 So of course you have to splash out on a side dish or two – like the perfectly cooked brussel sprouts – or ‘barbie sized cabbages’ as I’ve recently seen them referred to. The Tilbury’s dessert menu will satisfy any sweet tooth, and for those romantics who don’t mind sharing dessert there’s even a dessert platter for two. 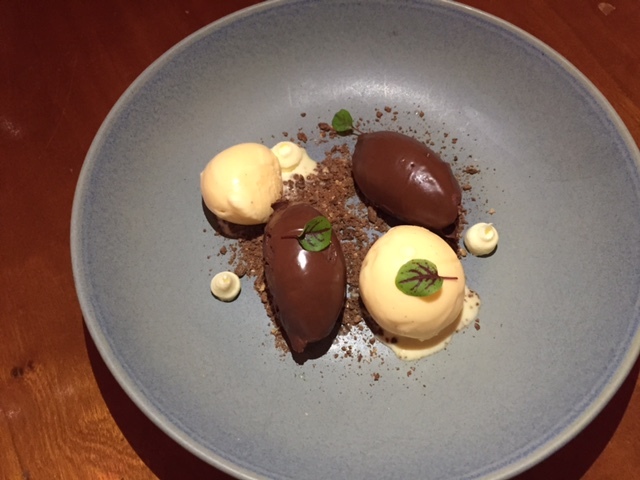 My feast wisely philosophy guided me to the low sugar option – 64% Valrhona chocolate mousse with chocolate soil, mascarpone and vanilla ice cream. It look like a work of art and tasted divine too. Not surprisingly with James working his magic on such premium French chocolate. So what else do you need to know? The restaurant’s wine list comes with surprisingly reasonable by the bottle prices. The long list is largely Australian but with a solid selection for committed Francophiles. And the beer? Choose from a solid variety of draught and bottled beer, including some of the less well known craft beers. 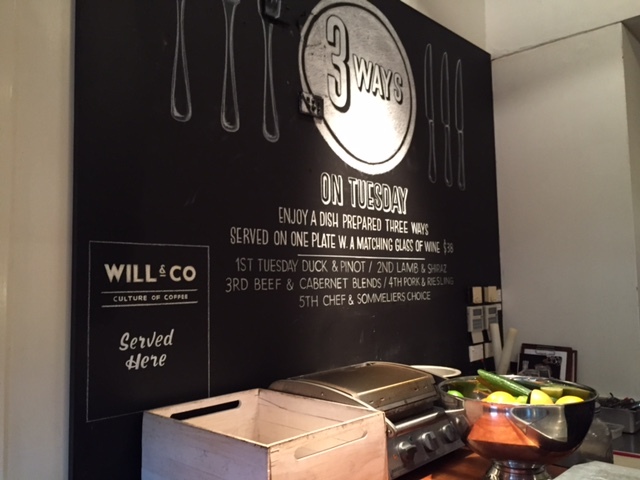 On a Tuesday enjoy the ‘3 ways’ dinner – a meaty dish prepared 3 ways with matching wine for $38. Or visit on a Sunday and indulge in a traditional Sunday roast. 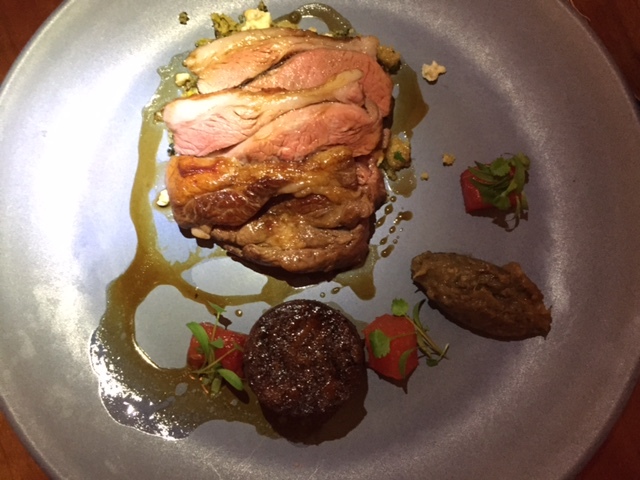 The scheduled rotation of different meats means there’s no risk of a surprise if you plan ahead – its juicy duck on the first Sunday of the month, followed by beef , then pork and finally the Chef’s choice. Like some of its well-regarded Paddington pub/hotel equivalents (I’m thinking Four in Hand and The Bellevue) I came away from my feast confident that The Tilbury boasts a ‘not-your-ordinary pub grub’ restaurant. 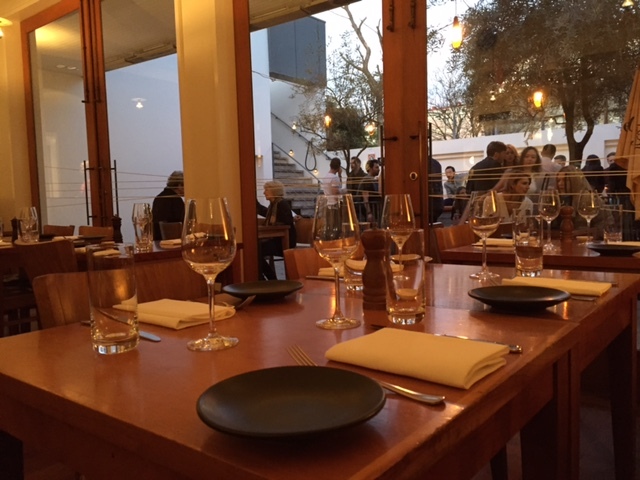 It’s only steps away from the glamour of Woolloomooloo wharf but offers a more casual and less wallet busting dining experience. 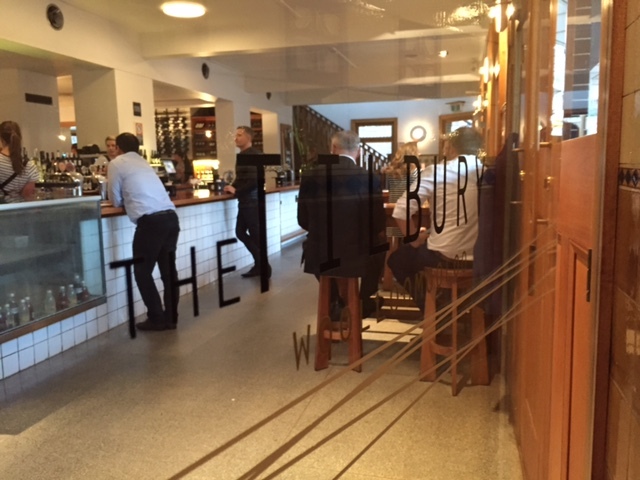 Tags: menu, pub, restaurant, review, The Tilbury Hotel, Woolloomooloo. Bookmark the permalink. Yes what a great spot for a party – always has that party atmosphere. And Es the mousse was divine – I love that it uses valhrona chocolate!